Authors: Zybin A.V., Pokrovsky A.V., Timina I.Y., Kharazov A.F., Adyrkhaev Z.A. Aim. Analysis of influence of risk factors (RF) on progression of atherosclerosis of brachiocephalic arteries after unilateral carotid endarterectomy (CEA) with the underlying treatment with statins. Materials and Methods. 262 Cases (262 patients) were analyzed. Influence of RFs on the frequency of cerebral circulation disorders (CCD), myocardial infarction (MI), survival rate, condition of the carotid arteries and on lipid profile with the underlying treatment with statins was evaluated. In the early period the results were evaluated in 100% of patients, in a long-term period – in 93.5%. Patients were arranged in groups: a group that received simvastatin – 41.6% in the preoperative period and 24.5% in the long-term period, a group of atorvastatin – 51.9% and 54.7%, a group of rosuvastatin – 6.5% and 20.8%, respectively. Predominating (83.2%) were patients with more than 3 RFs (according to SCORE scale). Results. Lethality rate in the analyzed sample group was 6.5%, the rate of fatal cardio-vascular complications (CVC) – 7 cases (2.3%), of non-fatal CCD – 5 cases (1.9%). A significant influence on the progression of alterations in the carotid artery was found in patients with 3 RFs (p=0.03). The length of atherosclerotic plaque (ASP) was maximal in patients with 5 RFs (0.01). In the presence of more than 3 RFs, elevation of the total cholesterol (CL) and of low density lipoproteins (LDLP) was noted, p=0.001. In the long-term period in the atorvastatin group the level of LDLP decreased by 19%, p=0.0001, in the rosuvastatin group the level of HDLP increased by 3.4%, p=0.02. In the rosuvastatin group, the recommended values of CL were achieved 64.7% more often in comparison with the simvastatin group, p=0.03. The rate of CVC increased in patients >68 years of age, р=0.04. The lethality rate increased in case of body mass index (BMI) ≥25-30 kg/m2 (р=0.05) and in case of type 2 diabetes mellitus (p=0.03). The influence of the following factors on long-term results was demonstrated: smoking (p=0.04), arterial hypertension (p=0.019), chronic cardiac insufficiency (p=0.01), a tendency to bradycardia (p=0.03), atherosclerotic lesions of more than one arterial pool (p=0.006). RFs influenced the rate of development of restenosis of the internal carotid artery (ICA) >50% on the side of the operation in 4 observations (1.5%). In the atorvastatin group the most significant positive influence on lipid spectrum was observed in comparison with other groups (by 47.1%, р=0.001).Therapy with atorvastatin stabilized the wall of ICA and of the contralateral common carotid artery (CCA) 17.6% (p=0.05) more frequently in comparison with simvastatin and rosuvastatin. Conclusion. A direct influence of RFs on the progression of atherosclerotic alterations in the carotid arteries and on the rate of development of cardiovascular complications in the perioperative and long-term periods, and also influence of underlying statin therapy on the parameters of lipid metabolism, and a higher effectiveness of synthetic statins were determined. statins, dyslipidemia, cholesterol, carotid endarterectomy, risk factors, surgical treatment. By WHO estimates, cardiovascular diseases are the leading cause of disability and mortality in the world. Cerebral circulation disorders (CCD) are the second leading cause of death in Russia. The leading cause of CCD of ischemic type is atherosclerotic lesion of brachiocephalic arteries. The course of atherosclerosis including that in the carotid system, is determined by existence of predictors – risk factors (RFs). Complex assessment of RFs permits to predict their negative influence on pathological processes in the arterial vessel wall and development of complications . The main method of treatment of a significant atherosclerotic lesion of the internal carotid artery (ICA) including an asymptotic one, according to ACST study, is carotid endarterectomy (CEAE) that decreases the frequency of development of CCD and mortality level [2,3]. Medicinal treatment is conducted with the aim of correcting RFs, reducing the risk of restenosis of the ICA, of the frequency of the endpoints (myocardial infarction, MI), CCD and of lethality in the perioperative period [4,5]. 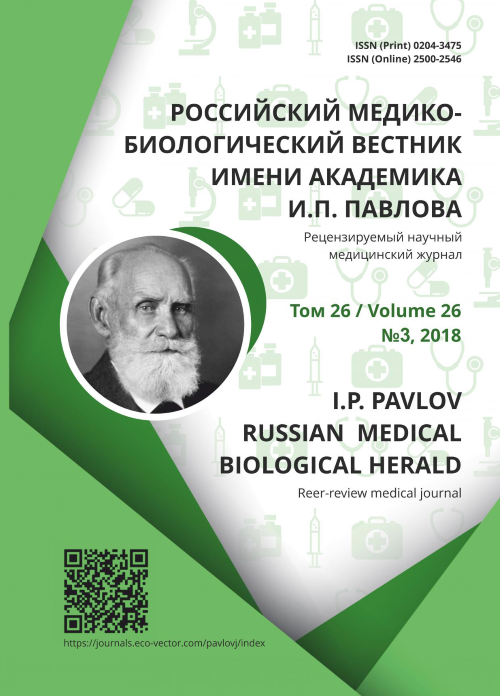 The research of SPARCL (Stroke Prevention by Aggressive Reduсtion in Cholesterol Levels) demonstrated effectiveness of use of statins for secondary prophylaxis of CCD through correction of the most important RF – hyperlipidemia . D. Efthymios, et al. (2016) gave a retrospective assessment of results of CEAE for 11 years (n=1639), including that with statin treatment. A mild progression of the lesion on the ipsilateral and contralateral sides, and also of CCD was demonstrated . In the preoperative period statins are administered to correct the lipid profile and pleiotropic effect of lipids . Pleiotropy is more expressed in synthetic statins that include atorvastatin and rosuvastatin. Pleiotropic effect is manifested by stabilization of an atherosclerotic plaque (ASP) and by anti-inflammatory and antithrombogenic activity [9,10]. The conducted research showed a necessity for correction of RFs that influence development of restenosis and progression of atherosclerosis in the contralateral carotid system, development of CCD, MI, and survival in the perioperative period and in dynamic control. However, up to the moment the extent of influence of separate statins and the necessity to achieve recommended values of lipid metabolism has not yet been determined, and it is the task in the given research work. Aim of work – analysis of the influence of RFs on progression of atherosclerosis of brachiocephalic arteries after one-sided CEAE with statin therapy. In A.V. Vishnevsky Institute of Surgery 262 CEAEs were performed in the Vascular Surgery Department in 262 patients with a unilateral significant lesion of ICA with the underlying statin therapy, from January 2009 to December 2010. In the period of observation (from 9 to 52 months) influence of RFs on the incidence of cardiovascular complications (CVCs), survival rate and condition of the carotid system on both sides was evaluated (by SCORE scale). All patients underwent color duplex ultrasonography of brachiocephalic arteries, and lipid profile was determined (with the constant statin therapy). In the preoperative stage statins were administered minimum 2 weeks before CEAE. In the perioperative and long-term periods patients were distributed depending on the conducted treatment with statins: a group of simvastatin (semisynthetic statin) – 109 patients in the perioperative period and 60 in the long-term period, a group of atorvastatin (synthetic statin) – 136 and 134 patients, and a group of rosuvastatin (synthetic statin) – 17 and 51 patients, respectively. The initial clinical characteristics of the studied groups of patients are given in Table 1. The average age of patients was 65.53±8.32 years, proportion of men and women was 1.6:1. In 180 patients of 262 (68.7%) three and four RFs were recorded. Concurrent pathology was pre-obesity – 45.2%, smoking – 48.1%, diabetes mellitus DM) – 21.4%, arterial hypertension (AH) – 93.9%, MI – 20.2%, heart rhythm disorders – 23.3%, chronic insufficiency of arteries of low limbs – 27.1%. Long term survival rate was 93.5%. Long term clinical characteristics of patients’ groups are given in Table 2. Long term dependence of the type of ASP on the extent of progression of the pathological process in the contralateral ICA was evaluated. On the basis of the classification developed in A.V. Vishnevsky Institute of Surgery (by prof. I.E. Timina), the analyzed cases were referred to type I (homogeneous ASP): 34 cases (13.1%) in the perioperative period and 62 cases (29.4%) in long term; to type II (non-uniform ASP with predomination of hypoechoic zone with the intact cap): 163 (62.7%) and 75 (35.6%), respectively; to type III (non-uniform ASP with predomination of hypoechoic zone with breakage of the cap): 44 (16.9%) and 6 (2.8%), respectively; and to type IV (non-uniform ASP with alternation of anechoic and hypoechoic zones with predomination of components of high echoicity with the presence or absence of acoustic shadow) – 19 (7.3%) and 68 (32.2%), respectively. The dynamics of progression of the narrowing of the coronary artery lumen was on average a little more that 1% with the following distribution depending on the extent of stenosis of the contralateral ICA: no stenosis – 41 patients in the long-term period (initial data in the perioperative period – 45 patients); 20-49% stenosis – 155 patients (initially 157 patients); 50-69% stenosis – 58 patients (initially – 56); 70-79% stenosis – 4 patients (initially – 0). Influence of RFs was evaluated by three main criteria: severity of the atherosclerotic process in the perioperative period, achievement of the endpoints in the 30-day postoperative period, results of atherosclerotic alterations and long term development of CVC. The obtained statistical data were processed by Statistica 7.0 program for Windows 7. Standard methods for assessment of statistical significance were used: Student’s t-test, F-test, etc. Statistically significant were considered differences at р<0.05. In the preoperative period the effectiveness of the conducted statin therapy was analyzed on the basis of reaching the target parameters of lipid metabolism. The level of CL (4.72±1.23 mmol/L) and of LDLP (2.26±0.88 mmol/L) was within the recommended values in the rosuvastatin group as compared to other groups (р=0.05), maximal parameters of total cholesterol and LDLP were recorded in the simvastatin group (Table 1). Patients with 3 and more RFs had hypercholesterolemia and increased level of LDLP (р=0.001). Risks for development of CVC were analyzed, and a higher amount of patients (by 68.7%) with ≥3 RFs was noted comparing with other groups (р=0.02), with a higher length of ASP in ICA (р=0.04). The extent of evidence of stenosis was also higher in patients with ≥3 RFs (р=0.03). In most cases at least one modifiable RFs was found which could be corrected and making possible to reduce the rate of CVC and to influence the speed of progression of the atherosclerotic lesion. The length of ASP in all groups of statin therapy was more than 2 cm, minimal parameters of the average length (23.35±8.15 mm) were seen in the atorvastatin group (р=0.05), maximal length of ASP (up to 48 mm) was noted in patents with 5 RFs (р=0.001). Lesion of more than one arterial system, predomination of instability of ASP and more evident extent of progression of stenosis were noted in the rosuvastatin group (p=0.04). Significant characteristics to determine the extent of influence of RFs were assessments of postoperative complications within 30-day period (Table 3). Perioperative lethality and CCD were 1.14 and 0.38%, respectively, no statistically significant difference between the groups was found. Postoperative lethality was noted in the groups of simvastatin and atorvastatin, the causes being death from cardiac insufficiency in the first case, from gastro-intestinal bleeding in the second case and from infectious complications in the third case. Neurologic complications: CCD and transient ischemic attack (TIA) were noted in the ipsilateral system on the first day after CEAE (n=2), both cases were in the group of simvastatin. The cause was formation of thrombosis in the reconstruction zone which required reprosthetics and plasty with synthetic patch. These complications resulted from technical errors. Distribution of cardiologic complications was relatively equivalent, with no statistically significant differences. The long term extent of influence of RFs on development of CVC was evaluated (Table 4). The influence on development of CVC (MI, CCD and TIA) in the analyzed sample of patients was demonstrated by the following modified RFs included into the SCORE rating scale of risks: smoking, AH and hypercholesterolemia. No negative influence of these RFs on progression of the atherosclerotic process in ICA was recorded. With a combination of ≥3 RFs, the alterations in the arterial vessel wall were more frequent (р=0.03). Long term lethality was 6.06%. Cardiovascular causes of death: AH (р=0.0001), rhythm disorders (5.9%, р=0.01), cardiac insufficiency (29.4%, р=0.008), MI (28.5%, р=0.00001). Factors that influenced lethality: increase in body mass index (BMI) up to 25-30 kg/m2 and more (р=0.05). Decline in lethality was noted in patients with the heart rate (HR) below 60 beat/min (р=0.03) and with heart failure (р=0.04), a significant decline was noted in patients of the atorvastatin group (р=0.05). Non-fatal CCD was noted in 5 cases (1.9%). The main RFs for its development: damage to more than one arterial system (35.3%, р=0.02), occlusion of arteries of the lower limbs (64.7%, р=0.0003), performed reconstruction on the arteries of the lower limbs (23.5%, р=0.0006), type 2 DM (41.2%, р=0.03). Effectiveness of statin therapy after CEAE was determined by development of restenosis of ICA, and also by peculiarities of atherosclerotic alterations in the contralateral carotid artery. Frequency of restenosis of ICA with lesion of more than 50% was 2%. These patients received atorvastatin, no influence of RFs was noted, no correlation dependences were determined. The most optimal criterion of effectiveness of statin therapy was determination of the condition of the contralateral carotid system. In the atorvastatin group the common carotid artery (CCA) remained intact as compared to other groups (р=0.02). The most evident extended lesion of CCA was noted in the simvastatin group (р=0.03). Progression of stenosis of the contralateral ICA was noted in 1.6% cases. The strongest influence on it was produced by: smoking (R=0.302, р=0.274), hypercholesterolemia (R=0.544, р=0.036) and disorder in LDLP metabolism (R=0.368, р=0.178). Dependence of the extension of stenosis of RF – R=0.619, р=0.006. In the atorvastatin group the wall of ICA was intact 17.6% more often (р=0.05) comparing with other groups. The group of rosuvastatin showed a more evident reduction in the total cholesterol level and in the speed of progression of stenosis in the contralateral ICA as compared with simvastatin group (p=0.03). In the long-term period, optimal parameters of lipid profile were achieved, with the most evident reduction in cholesterol level (by 6%) in the simvastatin group. In the atorvastatin group the average level of LDLP was 2.63±0.61 mmol/L, and the target level of LDLP was achieved 19.1% more often than in other groups (р=0.0001). In the rosuvastatin group the increment of the HDPL level was 3.4% which was statistically significant in comparison with the simvastatin group (р=0.02). The level of HDLP was higher in patients with two RFs in comparison with patients with 4 and 5 RFs (р=0.01). Thus, on the basis of the results of the conducted research it is possible to state that severity of atherosclerotic alterations in the carotid system in patients who need CEAE on one side and have insignificant atherosclerotic lesion of ICA on the contralateral side, with statin therapy, depends on the existence of RF. Besides, in SPARCL research the dependence was established between RFs and atherosclerotic lesion of carotid arteries . A direct correlation dependence was determined on the SCORE scale between the quantity of RFs and the extent of lesion of ICA. Thus, with increase in the quantity of risks to 3-4 in SCORE scale, the length of ASP in ICA proportionally increased (р=0.04). Maximal average parameters of the length of the atherosclerotic stenosis were reliably more common in patients with 5 RFs (р=0.001). The main RF indicating severity of alterations in the arterial wall is parameters of the lipid profile. In the given analysis, hypercholesterolemia – a RFs included into the assessment scale for development of CVC – has a direct correlation with development of neurological complications (TIA and CCD) and with cholesterol level. The increase in the level of cholesterol and LDLP proportionally rises with increase in the quantity of RF (р=0.001). Framingham Heart Study showed the influence of RFs on the extent of stenotic damage to ICA and elevation of cholesterol level [11,12]. There was also demonstrated the influence of statin therapy on achievement of the target values of lipid profile. According to our data, most effective was the group of rosuvastatin as compared to the simvastatin group in the preoperative stage (р=0.05). It is interesting that in some prospective studies the authors did not find any advantages of certain groups of statins, however, effective reduction in the incidence of complications in the perioperative period with statin therapy was noted [13-15]. Significant modifiable risk factors include smoking, AH, heart rhythm disorders, heart failure, atherosclerotic lesion of more than one arterial system and disorders in lipid metabolism. The conducted meta-analyses showed the influence of these RFs on alterations in the carotid system in different periods of observation with different force of action on the pathological processes [16,17]. The effectiveness of the conducted surgical treatment is determined by development of complications in the postoperative period. According to our data, the following factors influenced the incidence of complications in 30-day period after CEAE: age more than 68 years (р=0.04), obesity (р=0.05) and type 2 DM (р=0.03). No difference in development of the endpoints was revealed in groups with statin therapy, incidence of CCD and lethality was 1.14 and 0.38%. G.M. La Muraglia, et al. showed a low frequency of development of stroke and lethality in the perioperative period with lipid-lowering therapy (1.4%) . Existence of RFs determines development of restenosis of ICA and progression of atherosclerotic stenosis on the contralateral side. Besides, interrelation is identified between predictors and CVC: CCD, MI and lethality in the long term. According to different authors, frequency of restenosis after CEAE with correction of RFs and statin treatment within 2 years of observation ranges from 3 to 10% [7,16,17]; in our study restenosis was identified in 2% of cases. Progression of restenosis in the carotid system of the contralateral side depended on the following risk factors: smoking, hypercholesterolemia, high level of LDLP. Here, the most effective influence on stabilization of the wall of the carotid artery was found in the group of atorvastatin, and also its positive influence on RF (hypercholesterolemia, high LDLP level). In the rosuvastatin group a more evident effect was noted on hypercholesterolemia and progression of contralateral stenosis (р=0.05). Long-term complications were associated with smoking, AH, heart rate disorders, cardiac insufficiency and multifocal lesion of the arterial system which correlates with the results of research of I. Barbetta, et al. . Lethality in our study was 6.5% which is comparable with the data of G.M. La Muraglia, et al. .
Long term parameters of the lipid profile are the most optimal criteria for choice of statin treatment group. In our research the highest influence on dyslipidemia was noticed in the group of synthetic statins (atorvastatin and rosuvastatin) in comparison with semisynthetic statins (simvastatin). The moderate correction of cholesterol level was noticed in the atorvastatin group (р=0.0001). On the initial administration in the group of rosuvastatin, cholesterol was at the recommended level and remained at this level during the whole period of observation (р=0.05). According to the results of study, administration of semisynthetic statins is unreasonable, since the average values stay at the level exceeding recommended values. Positive influence of synthetic statins was also demonstrated in other works, in particular, in ARBITER research which showed 48.5% reduction in LDLP level with administration of atorvastatin . In the rosuvastatin group a favorable influence on HDLP level was noted, with maximal increase in HDLP in patients with 2 and more RF (0.01). It should be noted that no independent influence of nonlipid RFs on lipid metabolism was recorded. Risk factors produce a direct effect on development of atherosclerotic alterations in the carotid system and, in result, on the frequency of cardiovascular complications. The conducted research confirmed the necessity of correction of modifiable risk factors, in particular, by administration of statins in carotid endarterectomy both in the perioperative period and long-term. According to our data, the most optimal in this category of patients was administration of synthetic statins (atorvastatin or rosu-vastatin) which agrees with the results of the works of other authors. Administration of semisynthetic statins (simvastatin) is unreasonable, according to the results of the conducted analysis, since the average parameters of low density lipoproteins remain at the level exceeding the recommended values. Aridi HD, Locham S, Nejim B, et al. Comparison of 30-day readmission rates and risk factors between carotid artery stenting and endarterectomy. Journal of Vascular Surgery. 2017;66(5):1432-44. doi: 10.1016/j.jvs.2017.05.097. Halliday A, Mansfield A, Marro J, et al. Prevention of disabling and fatal strokes by successful carotid endarterectomy in patients without recent neurological symptoms. Lancet. 2004;363:1491-502. doi: 10.1016/S0140-6736(04)16146-1. Moore WS, Barnett HJ, Beebe HG, et al. Guidelines for carotid endarterectomy. A multidisciplinary consensus statement from the Ad Hoc Committee, American Heart Association. Circulation. 1995;91:566-79. Volteas N, Labropoulos N, Leon M, et al. Risk factors associated with recurrent carotid stenosis. Int Angiol. 1994;13:143-7. Amarenco P, Bogousslavsky J, Callahan A. III, et al. Highdose atorvastatin after stroke or transient ischemic attack. N Engl J Med. 2006;355:549-59. doi: 10.1056/NEJMoa061894. Avgerinos ED, Go C, Ling J, et al. Carotid artery disease progression and related neurologic events after carotid endarterectomy. J Vasc Surg. 2016; 64(2):354-60. doi: 10.1016/j.jvs.2016.02.026. Paraskevas KI, Athyros VG, Briana DD, et al. Statins exert multiple beneficial effects on patients undergoing percutaneous revascularization procedures. Curr Drug Targets. 2007;8:942-51. Koh KK. Effects of statins on vascular wall (vasomotor function, inflammation, and plaque stability). Cardiovasc Res. 2000;47:648-57. Perler B. The effect of statin medications on perioperative and long term outcomes following carotid endarterectomy or stenting. Semin Vasc Surg. 2007; 20:252-58. doi: 10.1053/j.semvascsurg.2007.10.008. Wilson PW, Hoeg JM, D’Agostino RB, et al. Cumulative effects of high cholesterol levels, high blood pressure, and cigarette smoking on carotid stenosis. N Engl J Med. 1997;337:516-22. Oganov RG, editor. Natsional’nyye klinicheskiye rekomendatsii VNOK. 2-e ed. Moscow: Sitsileya-Poligraf; 2009. (In Russ). Schouten O, Kertai MD, Bax JJ, et al. Safety of perioperative statin use in highrisk patients undergoing major vascular surgery. Am J Cardiol. 2005;95:658-60. Durazzo AE, Machado FS, Ikeoka DT, et al. Reduction in cardiovascular events after vascular surgery with atorvastatin: a randomized trial. J Vasc Surg. 2004;39:967-76. Ballotta E, Da Giau G, Ermani M, et al. Early and long-term outcomes of carotid endarterectomy in the very elderly: аn 18-year single-center study. Journal of Vascular Surgery. 2009;50(3):518-25. doi: 10.1016/j.jvs.2009.04.053. La Muraglia GM, Stoner MC, Brewster DC, et al. Determinants of carotid endarterectomy anatomic durability: еffects of serum lipids and lipid-lowering drugs. Journal of Vascular Surgery. 2005;41(5):762-8. Barbetta I, Bissacco D, Carmo M, et al. Validation of a risk scoring system to predict life expectancy after CEA in patient with asymptomatic carotid artery stenosis. European Journal of Vascular and Endovascular Surgery. 2015;50(3):396-7. Copyright (c) 2018 Zybin A.V., Pokrovsky A.V., Timina I.Y., Kharazov A.F., Adyrkhaev Z.A.